First of all we try to give as much help as possible with theoretical learning. Similarly we put a lot of time into practicing skill demonstrations with you, while giving thorough briefings/debriefs when you are assisting on courses. In addition you will also be given plenty of opportunity to get experience leading dives. There will be an instructor always on hand at the back of the group to encourage you and advise. Doing PADI Divemaster course is an incredible experience, and especially on Nusa Lembongan. Hence here at Big Fish Diving we work hard to ensure that it is one you will never forget! Knowledge Development – the PADI Divemaster manual you will covers topics such as risk management, customer perspectives and career opportunities within the dive industry. Knowledge reviews for each chapter will be completed and discussed with your instructor. A large part of the Divemaster theory comes from independent study and review sessions, in preparation for the final exam. Waterskills and Stamina – 4 swim tests must be completed worth a maximum of 5 points each, with a total of at least 12 points needed before certification. There is a 400m swim, a 15 minute tread/float, an 800m snorkel swim and a 100m tired diver tow. This section also assesses your rescue skills with an unconscious diver scenario. Finally, you will be assessed on your ability to demonstrate the 24 basic dive skills. You will be given ample time to practice these during the course. 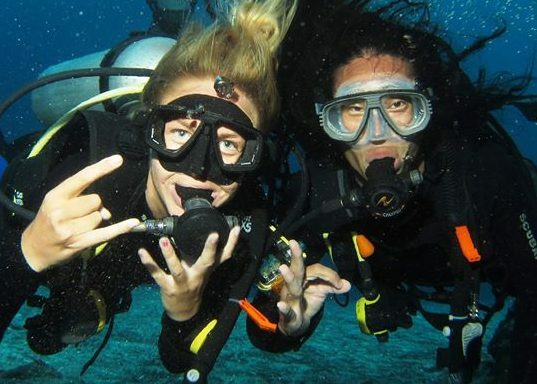 Big Fish Diving instructors pride themselves on creating Divemasters able to give Instructor-quality demonstrations. Practical Application – A lot of time is given to this area of the course, where you will find yourself assisting instructors daily. You will take part on a variety of dive courses, mapping a dive site, conducting an equipment exchange underwater with another diver and carrying out 2 PADI Divemaster conducted programmes. As future dive professional we would also expect you to have some basic dive equipment like mask, snorkel, dive computer and SMB. All of which we can help you buy locally in Bali. 1. Big Fish Diving is based in the Nusa Penida marine protected area. This is consistently rated as offering the best scuba diving in the Bali and Lombok region, therefore you will not tire of the marine life and coral reef while diving with us. It is also the only place in the area where you can regularly see manta rays and the incredible Mola Mola (oceanic sunfish) if you time it right. The diving around the three islands can be challenging at times and provides a great learning experience for those hoping to become professional divers. As a result by the end of your PADI Divemaster course, you will really feel competent diving in currents and able to deal with the challenges this involves. 2. You will have a chance to be involved with the Marine Megafauna Foundation team who are based on Lembongan and give their twice weekly marine talks in our yoga shack. By the time you have finished your PADI Divemaster training you should be experienced in spotting, caring for and ID’ing our local population of manta rays. 3. To all our Divemaster Trainees we offer a 10 class yoga card. Yoga Shack Lembongan is situated right on site at Big Fish Diving and Secret Garden Bungalows. As a part of Divemaster package you may use this card at any of our daily yoga classes. This will furthermore help your breath control and calm your mind. In addition, if you are new to diving and already totally in love with it, we offer special deals on bundle of courses from PADI Open Water to PADI Divemaster. As a PADI Divemaster candidate you will be welcomed into the Big Fish Diving family! There are a variety of accommodations to choose from, all within walking distance of the dive centre. Expect to pay around IDR 2,500,000 – 3,000,000 per month for a fan room with private bathroom. Will depend on your current level and experience. As well as the Divemaster course fees payable to us there is also an application fee payable to PADI on completion of your course. You will also need to have your own set of PADI Divemaster manuals which you can buy yourself or we can help you buy them once you are here. Finally contact us today to find out the great offer we have saved for you! We had a dive package with BFD and accommodation in their Secret Garden Bungalows and it was great choice. Everything was near and easy. Dive staff is super friendly and very professional. Our divemasters were brilliant in spotting the small stuff and also showed us loads of mantas. Everything is neatly organized and very safe. I would love to come back soon.